ARTDECO now here in the Philippines. 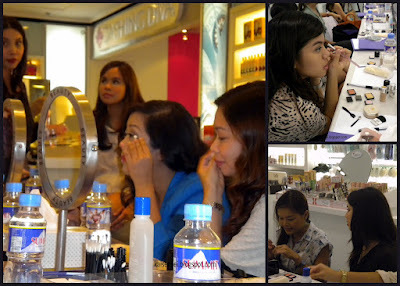 I don't often get to attend makeup workshops so I was really looking forward to the ARTDECO Beauty Bloggers Workshop held at Beauty Bar, Greenbelt 5, Philippines. ARTDECO: Germany's no. 1 Selective Makeup Brand was created in 1985 and is now available all over Europe and the world and now back here in the Philippines! ARTDECO is more than just a cosmetic brand - ARTDECO combines numerous collections into one integrated concept which is unique on the market. ARTDECO products are tailored to customer expectations. ARTDECO stands for individuality that customers demand from a premium retailer, just as much as the exclusivity of high-priced international brands. ARTDECO symbolizez trends; it incorporates the trends faster than its competitors. This enables ARTDECO customers to obtain the newest must-have products at affordable prices at all times. We were graced by Make-up Artist Ms. Carmen Reyes who showed us how to use the ARTDECO products. She demonstrated how to make a day to night look on blogger Issa. And also with the help of Angela from Lush Angel, Ms. Carmen also showed us how to make the "Red Lips" look your very own. One of the awesome things that Ms. Carmen showed us was this very helpful ARTDECO Eyebrow Stencils which I'm really loving! I have very thin and messy eyebrows so this ARTDECO Eyebrow stencils and Eye brow powder is definitely a must have for those having eyebrow defining problems. Eye Brow Stencils pack has a brush applicator already and three Eye Brow Stencils to choose from. The bloggers were all given a chance to try out their products. 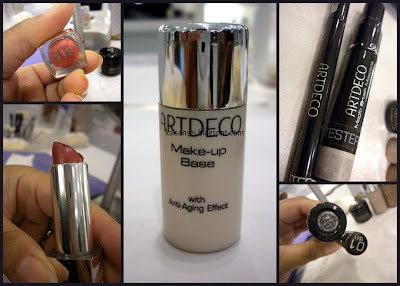 Here are some of the ARTDECO products that I was able to try out and really liked. ARTDECO Hot Chili Lip Booster really plumped my lips! I tried this one out and fell in love with it! Its a must have!!! ARTDECO Professional Brushes and Eyeliners. ARTDECO also has nail polishes! Uniquely ARTDECO - Create your own Make-up Palette and get your Beauty Box Quatro for Free! With Miss Carmen Reyes at the ARTDECO Event. 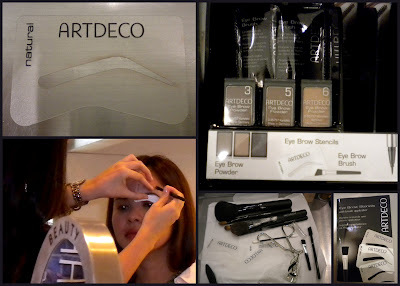 Anyway, I'd like to thank Beauty Bar Philippines and ARTDECO for this event! Hehe.. couldn't resist getting this shot! Thank you ARTDECO and BEAUTY BAR! The eye shadow base, lip stylo (lip foundation), and high performance lipstick are my favorites! Hey Coffeeholics! Stay updated by following BEAUTY BAR PHILIPPINES on Twitter. Have a great week!